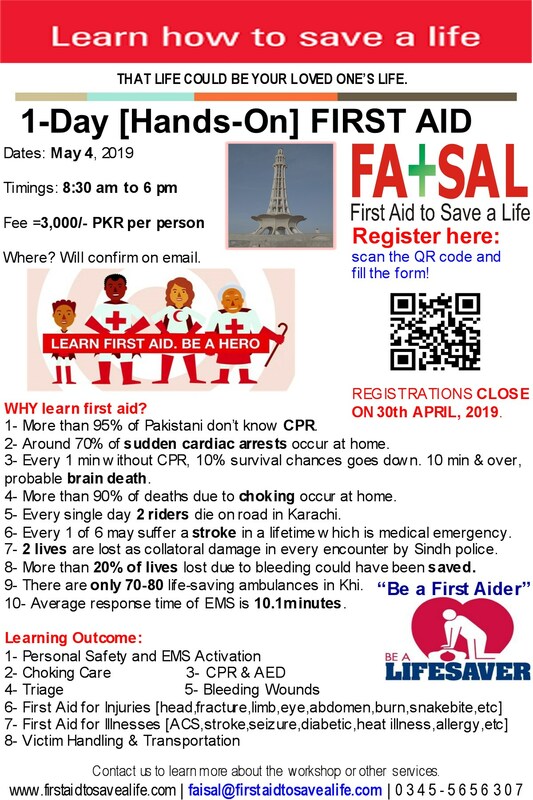 First Aid to Save a Life (FATSAL) Pakistan is pleased to announce their upcoming internationally accredited practical training course, First Aid, CPR and AED, in Islamabad on March 30, 2014. This is a registered training course and globally recognized. This training program is designed specifically for the occupational first aid provider and fulfills industry requirements. The course is based on the American Heart Association (AHA) and other recognized training and resuscitation organization’s guidelines for CPR and First Aid. Are you worried about accidents and real life emergencies? As long as people are involved in activities, there will be accidents. But with training and practice First Aid, some injuries can be minimized. Come join us on March 30, 2014 in Islamabad to learn some of the basic life saving skills to save lives and learn to become hero for someone and that someone can be your own family. This entry was posted in 1-Day Training Programs, Advanced First Aid, AEDs, Basic First Aid, CPR and AED, emergency care and first aid, Emergency First Aid, First Aid, First Aid and CPR, First Aid CPR and AED, First Aid Training Programs and tagged 2014, 2014 training course, accredited training program, advance first aid, AED, aed training, aed training programs, aed trainings in pakistan, AHA, AHA approved first aid training courses, AHA First Aid Training Courses, American heart association, anti snake venom vials and pressure bandage, anti-snake venom vials, ARC First Aid Training Courses, automated external defibrillator, basic first aid, basic life saving skills, Cardio Pulmonary Resuscitation, control of bleeding in snakebites, conventional CPR training vs online CPR class, courses, CPR, CPR and AED for Adults, cpr training, cpr trainings in lahore, defibtech aed, discount offers, discount offers on trainings, first aid, first aid training, first aid training courses in hyderabad, First aid training courses in islamabad, first aid training courses in lahore, first aid training providers, first aid trainings for free, first aid trainings in islamabad, free first aid courses, Hands-Only CPR, hse courses in islamabad, HSE courses in pakistan, hse training courses in islamabad, hse training courses in karachi, hse training courses in lahore, HSI, islamabad, Karachi, Lahore, medic and aha, medic first aid, medic first aid trainings, medic usa, new courses launched in 2014, occupational safety training institute pakistan, online CPR training, Pakistan, sudden cardiac arrest, training calendar for 2014, training course, training program, trainings. Bookmark the permalink. Believe it or not, many organizations are at grave risk of being unprepared in an emergency—while at the same time, they reassure themselves that they are ready, because they have installed an AED. AED installation is just one small part of being ready. You are very right. At first many of the organizations just don’t include the types of emergencies they could face and they only think about the one or two types and claim to be ready to deal with any emergency. I pray for them to learn lesson by not affecting themselves by such an devastated emergency to update their emergency preparedness plans.